The 2014 Titans will be led by seniors all over the field. Sage DeVault (committed to MCLA Arizona State) who really impressed coaches and recruiters alike in the offseason, will anchor Coach Adam Miner’s offense. He is a strong leader and an intelligent player who will make sure he’s involved in every play. Devault will be joined by Blake Warner, a junior that will test teams as to who they decide to cover with their best defensemen. Quick and smart, he is hard working and a ground ball enthusiast. Seniors Matt Costanzo and Brandon Mayo will lead the midfield in a system that suits their style of play very well. Look for big numbers from these two. Anchoring the defense is senior defenseman Griffin Schneider and junior goalie and Michigan commit Gunner Garn. Schneider is a strong all-around defenseman whom coach Miner should have confidence in anywhere on the field. Garn played extremely well this off season and disappointed a lot of recruiters when they found out he had already committed to Michigan. He will be one of the best goalies in Orange County this year. Even with a talented offense, coach Miner believes that it will come his defense to take Tesoro deep into the playoffs, “I don’t want to give anything away, but I would say our defense will surprise this year. We have a core of hard working defensemen that work well together. That chemistry should have good results during the season.” Tesoro’s won the South Coast League title each of the past two seasons by sweeping rival San Clemente–twice in overtime two years ago; last year by one goal and once by two goals. It’s a battle to watch again this year. In order to achieve their goals, Tesoro will have to make the tranformation from a “me team” to a “we team.” Last year’s team was loaded with talent but Miner said the team needs to expand their culture and play to be more team-oriented on both sides of the field. 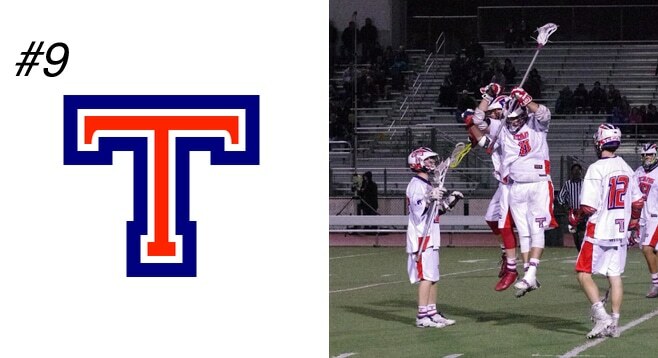 This transition may come naturally as Tesoro lost a large number of starting seniors (all but two positions). Offensively, the loss of Jake Douglas and Chase Warner will affect them but DeVault and Warner are poised to take on the new burden. All three defensive starters were lost last year; Matt Adam, Connor Toohey and Jacob Ostheimer. The loss of core members of a strong team will be felt but Tesoro has done a good job with their feeder program over the last few years.